Bobskis have joined up with the Use Your Head campaign and are offering an exclusive 10% discount on Bobskis Sledges and Accessories! Bobskis have reinvented sledging, replacing the traditional wooden sledge and its flimsy plastic counterparts with its lightweight durable Polarpol and design. Bobskis are designed and hand-made in the UK from high-spec components. 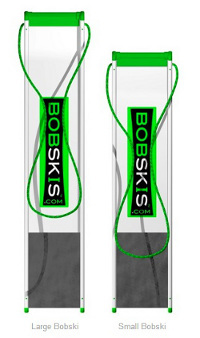 Bobskis combine extreme performance with ease of use. They don't need a lot of snow and work well on gentle slopes, where other sledges struggle, making them great for the UK as well as winter holidays. Why did Bobskis join the Use Your Head campaign? "Always supervise children. Make sure they are safe and that they know it's cool to wear a helmet." "Sledging has never been so much fun! We want it to stay that way. That is why at Bobskis we support the Use Your Head campaign. We recommend that you always wear a helmet when using Bobskis. Always supervise children. Make sure they are safe. Make sure they know it is cool to wear a helmet."